Available in 3 different channels. Capp Aero 384 Pipettes are available in 16-, 48-, and 64-channels, designed to make 384-well plate work easier and faster. Speeds up work. Increases productivity in your lab by drastically decreasing the amount of time you'd dedicate to an experiment. Volume range. 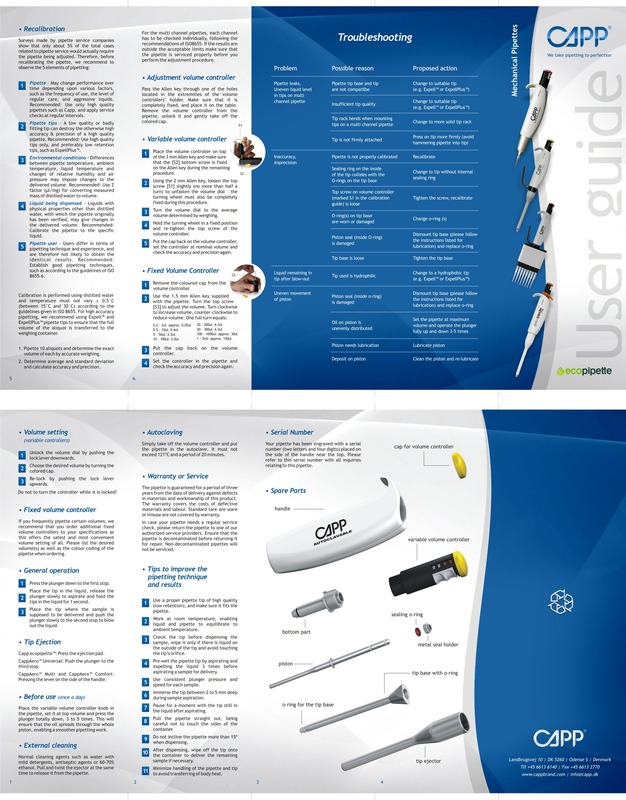 Depending on the specific pipette, Capp Aero 384 pipettes have a volume range spans from 0.2 to 50 uL. Ideal applications. CappAero 384 Pipettes are perfect for PCR, qPCR, microarray, and MALDI spectrometry techniques. Fully autoclavable. Can be taken apart to perform preventative maintenance; an ergonomic grip that can be rotated 360 degrees to fit left or right handed users. Interchangeable knobs. Able to change the knob according to the volume you desire. Warranty. CappAero 384 Pipettes come with a 3-year warranty. Why the Capp Aero 384 Pipettes? Most applications that deal with 384 plates utilize expensive automated systems, Capp Aero 384 Pipettes are the world's only alternative to quicker and highly precise pipetting of 16-, 48-, or 64-wells without automated equipment. Commonly used in pharmaceutical, medical, military, academic, and government laboratories, the Capp Aero 384 Pipettes drastically increase the speed of your work while still getting the accurate results you want. 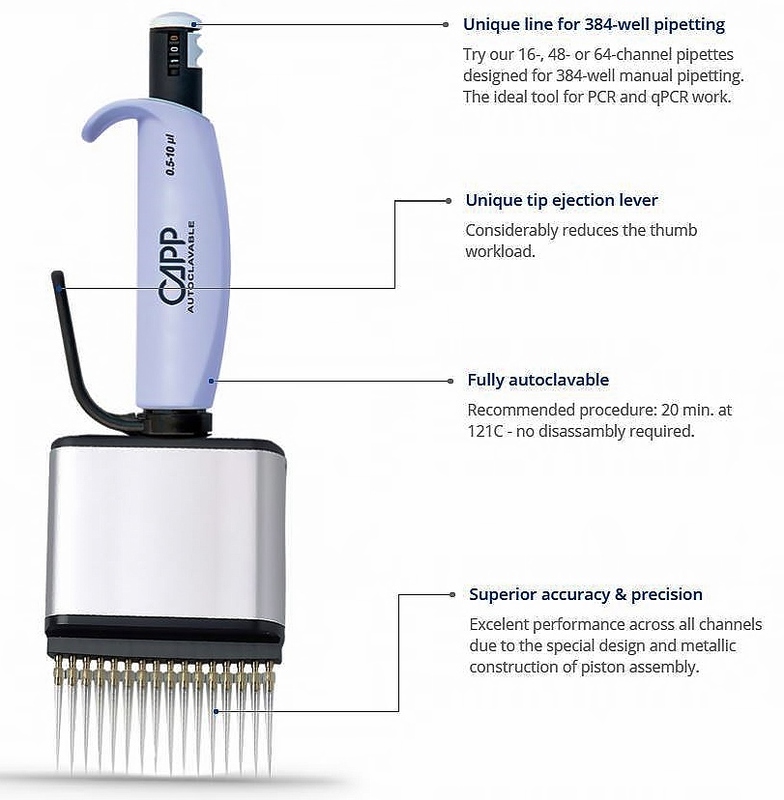 Order a CappAero 384 Pipette, today! 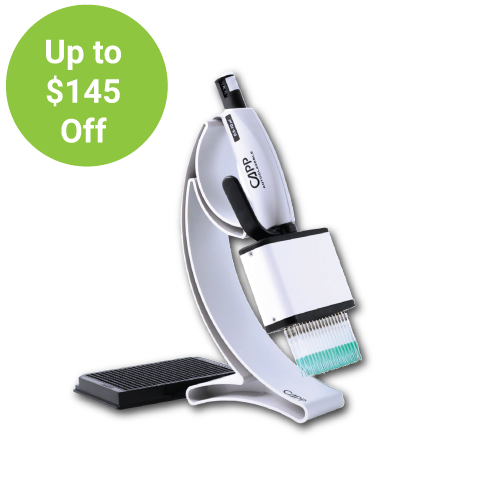 Buy 2 CappAero 384 Pipettes & Save 5% More!